A view of Andrew Haswell Green Park, looking south from East 63rd to East 60th Streets. UPPER EAST SIDE — When $5 million in city funding was raised to renovate a neglected piece of the East River esplanade at East 60th Street, nobody figured that the area's moorings may have been eaten. When the Parks Department started an engineering study for the second phase of improvements at Andrew Haswell Green Park last June, it found that marine borers — underwater organisms that feed on wood — had been chomping on the pilings supporting it. Now they estimate the pilings holding up the park have another eight years before they start to crumble into the East River unless $15 million is found for repairs. And neighbors say there's no money for the much-needed work. 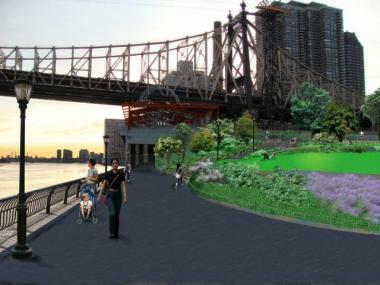 A rendering of what Andrew Haswell Green Park will look like after the renovation. When the Parks Department last June started the necessary engineering study for the second phase it found that marine borers — underwater organisms that feed on wood — had been chomping on the pilings supporting the park. 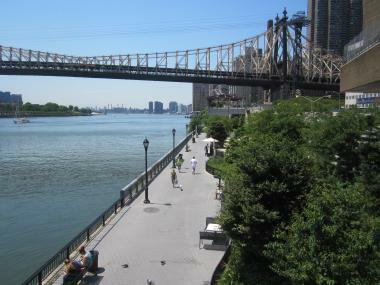 "When the water was dirty, the pilings were good," said Judy Schneider, Community Board 8's co-chair of the Queensboro Bridge Area Committee overseeing a neighborhood-based plan for the area. "Now that it's clean, the marine borers have been having a feast destroying the pilings." The first phase of the park's renovation, which included the addition of two dog runs, chess tables and benches along the waterfront from East 61st to 63rd streets, has been completed. Next, the Parks Department is expected to renovate the pavillion atop a former sanitation facility — where yet another dog run has quietly taken hold underneath Alice Aycock's giant aluminum helix sculpture from 1995. "We are planning to renovate the top of the pavilion with grasses, groundcover, lawn, benches and game tables," a Parks Department spokeswoman wrote in an email. "We have roughly $2 million allocated for the pavilion work which will be moving ahead now because it will not be affected by the pile reconstruction and related construction access in the future." She added, "Parks decided, and the funders and community board agreed, that it was important to keep the momentum moving on this important project." But the waterfront level renovations — which involved trucking in tons of dirt to create the grassy expanses — can't begin until other pilings are fixed. "It's going to be a lush park with a beautiful green area," Schneider said, "but we need the money for the pilings." She noted that if plans to open up an inaccessible chunk of the East River greenway, from East 38th to 59th streets, move ahead — pending a complicated deal with the United Nations — it may not end up linking with the rest of the esplanade if Andrew Haswell Green Park falls apart. "They'll spend millions, and what is it going to hook into?" Schneider asked. Park-goers were glad to hear that some renovations will take place — though dog walkers who frequent the run at the pavilion had mixed feelings that they'll lose their spot. "People are always saying that this is going to be closed down for renovations," said Trent Saner, 26, a professional dog walker. "But I haven't seen anything yet. I'm fine with it as long as they bring the dog run back." When he was informed that the dog run was not included in the plan, he said maybe he'd go to the dog run at East 50th Street. He brings his dogs to the pavilion run instead of the official ones down below, which are lined with sand. Owners don't like their dogs to get dirty in the sand, he said. "I'm here all the time," Saner said. "The dogs love it." The 1.29-acre Andrew Haswell Green Park was named after the urban planner who paved the way for Central Park's creation, as well as the American Museum of Natural History and Metropolitan Museum of Art, among other landmarks.